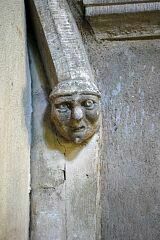 Pevsner says the church has a c.1160 north arcade, c.1180 chancel arch responds and was extended in the C14th. It has a perpendicular tower. The C16th aisles have been demolished. Church. C12-C13 and C15, much restored 1862/3, including new roof and aisles. Coursed, squared stone and rubble stone and stone dressings. Welsh slate roof with stone-coped gables. Buttresses, some with set-offs. West tower, nave, aisles, chancel, and north chancel porch. 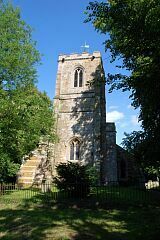 C15 tower of 2 stages, with west buttresses, west window, blocked south arch and blocked window within. South-west staircase has west loopholes and projects to south. Four 2-light bell openings, west with later transom. Battlements and small, low, recessed, leaded spirelet with weathervane. 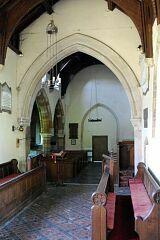 Blocked, double chamfered nave arch with door. Late Norman 2 bay north arcade, carefully rebuilt, 1862. Arches with roll and zig-zag mouldings. Round pier with capitals and responds, with lobed frieze to capitals. 2 bay south arcade, with double chamfered arches on octagonal pier. Two 2-light dormers to Cl9 roof of 2 bays, and 1/2 bay at either end. Curved braces to collars. North aisle has windows with plate tracery, one with fragments of medieval glass. 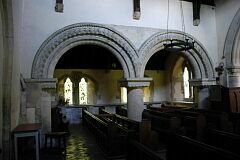 Many-moulded chancel arch, also rebuilt. Chancel has two windows to north and south, both to east flat-topped. East window of 1862 with Decorated tracery. Cl9 stained glass. Gabled porch to vestry, probably of 1862, with flat-topped doorway. 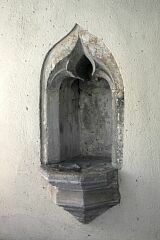 Window with fragments of medieval stained glass. Chancel roof similar to nave. 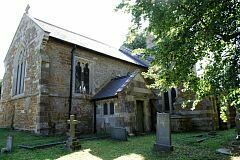 Chancel also has small north single-light, north doorway, and south piscina. South aisle has single-light windows to west and east, and flat-topped 3-light to south. Many-moulded south doorway with a shaft either side. 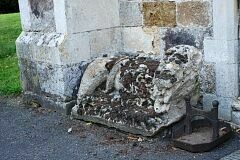 To either side, a medieval carved stone lion couchant on plinth. Both aisles rebuilt 1862/3 after being pulled down late C16. 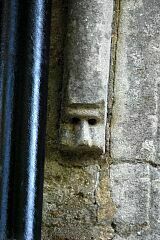 C15 font. Pevsner, and White's 'Leicestershire and Rutland', 1877. 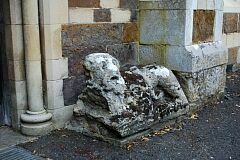 Project Gargoyle survey work in 2011 recorded a small 12th century carving in the chancel arch, together with two free-standing lions by the church porch (Pevsner suggests they are pre-Reformation) and a small number of label stops which may be 13th or 14th century, or may be from the 19th century restoration. 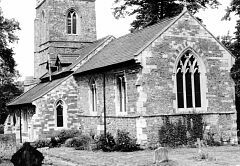 Pevsner N, 1984, The Buildings of England Leicestershire and Rutland, p72 (Bibliographic reference). SLE4. --- Bibliographic reference: Pevsner N. 1984. 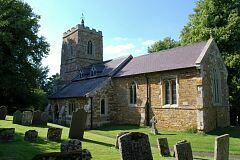 The Buildings of England Leicestershire and Rutland. p72.